Civil War Game by Learningames is a fun and easy way to learn important information about historical events and geographical areas. It is a trivia board game for 1 to 6 players, grades 4-12, age 8 and older. The Civil War Game was published in 1974 by Learningames. Learningames is a registered trademark of Educational Materials Associates, a Virginia-based retailer of affordable and authentic history, geography, government and science games. The game was primarily developed for educators. It is not easy to find at traditional toy venues like some of the more popular board games. But, it is available online from Leaningames and it is widely available in gift stores at museums, historical sites and museums. 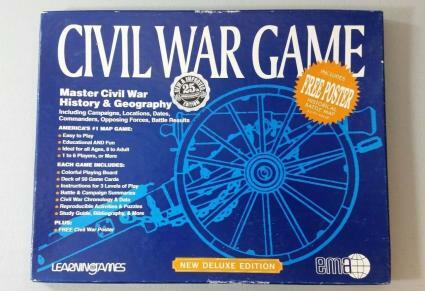 The Civil War game is designed as an educational board game to teach the facts and figures of the Civil War. The game is very simple in design. It is basically a trivia game with flash cards. The players take turns answering questions involving the information presented on the game cards. A player can "win" a card if they answer the question correctly. A player can also win a card if they correctly challenge an answer given by another player. The game can be used in schools or in smaller groups in the classroom, a home schooling setting or as a fun game for the entire family. The information in the Study Guide can be used as the basis for history lessons. Playing board - A map of the southern states with numbers and symbols showing the locations of key battles and events. Deck of 50 game cards - The cards are two-sided. One side has the name of an event. The other side has a number with the important information about the event. Study Guide - The guide includes very detailed battle information including commander's names, number of troops, combat movements and casualties. The player with the most cards at the end wins the game. Standard Edition - For small groups of 1 to 6 players. Teacher's Edition - For classes of 1 to 30 or more students.